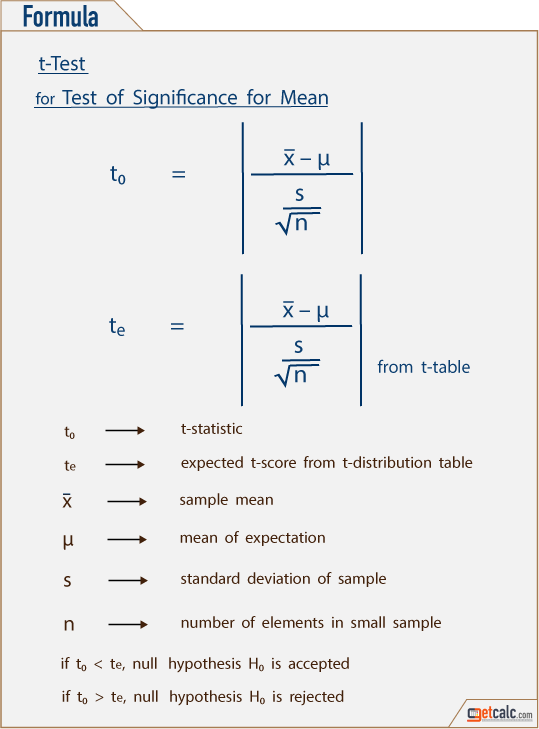 Student's t-test calculator for test of significance (hypothesis) for single mean, difference between two means & two equal sample sizes (paired t-test) by using t-statistic (t0) & critical value of t (te) for small samples of population in statistical surveys & experiments. This calculator is featured to generate the complete work for test of significance for small samples using one or two tailed t-test may helpful for grade school students to solve t-test worksheet or homework problems. In the theory of statistics & probability, the below formulas are the mathematical representation to estimate the t-statistic for the test of significance for sample mean with unknown population variance, difference between two sample means with equal but unknown population variance & related samples with unknown population variance. Users may refer these below formulas to know what are all the parameters are being used in the test of hypothesis for small samples. Users may use this one or two tailed t-test calculator to verify the estimation along with the complete work for test of significance using t-distribution table. In student's t-test, the t-distribution table is used to find the critical value of te at a stated level of significance such as 0.10, 0.50, 0.90, 0.99 level. For example, 1%, 5% & 25% significance represented by t0.01, t0.05 and t0.25. This expected of t-value or t-critical te is compared with calculated or t-statistic t0 in the statistical experiments to accept or reject the hypothesis H0. The critical value of 5% for two tailed test lies on both sides of the distribution with the rejection area of tν = t0.025 on each sides. In other words, tν at the significance level of 0.20 for single tailed t-test is equal to tν at the significance level of 0.10 on both sides. The critical value or rejection region of t-distribution for small samples can be obtained by referring the t-distribution table at stated level of significance such as 1%, 5%, 9%, 10% or 50% etc or 0.10, 0.50, 0.90, 0.99 etc. 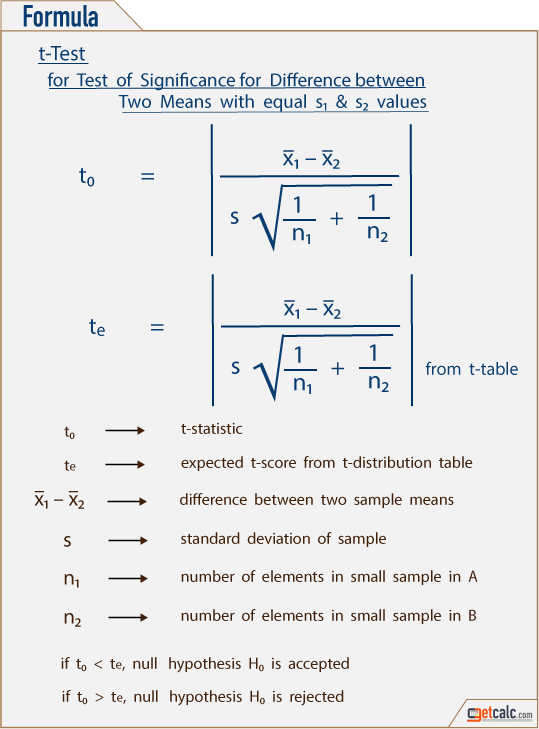 The difference between the sample mean or means is not significant, if the calculated or t-statistic t0 value is lesser than the rejection region value (t-critical) from the t-table. Therefore, the null hypothesis H0 is accepted. The difference between the sample mean or means is significant, if the calculated or t-statistic t0 value is greater than the rejection region (t-critical) value from the t-table. Therefore, the null hypothesis H0 is rejected. The below are the solved examples with step by step estimation for the test of significance for sample mean with unknown variance, test of significance for difference between two sample means with equal but unknown population variance & test of significance for relative samples (paired t-test) with unknown population variance using t-test. In addition to the below examples, users can generate complete work for one or two tailed t-test for any corresponding input values.